Matching to the season start of the NFL, Madden 18 brings the round egg back into the domestic living room. Like a steam roller, Khalil Mack mows Tom Brady. Mack grabs the free leather and goes to the end zone shortly before the end. The Raiders enter the Super Bowl 52! What sounds like a dream of many Raiders fans can be reality in the latest Madden offshoot of the well-known American football franchise from EA Sports. Matching to the season start of the NFL, Madden 18 brings the round egg back into the domestic living room. For the first time, developers rely on the Frostbite engine, which significantly increases the graphics quality of the sports simulation. In the "Journey" mode, players take control of one of two gifted college players and experience with them the ups and downs before the most important day in the life of a young American football player: the Draft. The franchise mode has largely been maintained. 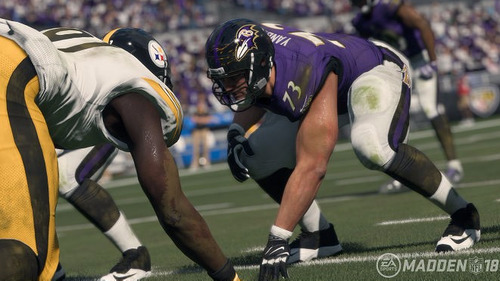 Why not: EA Sports retains a lot of what has been praised in the past. From Miller, Khalil Mack and JJ Watt in a Defense? No problem for Madden players! In the "Ultimate Team", Madden players can again assemble their dream team as in previous years and compete with computer-driven opponents or friends. Finally, the wait for the NFL and the new Madden is over. Much is left, with the "Journey" mode EA Sports takes a step towards story mode. More like this in the future. And a Super Bowl victory for the Raiders.